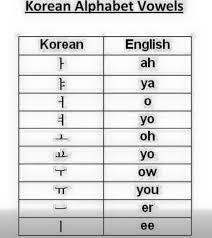 Is the Korean alphabet to English charts the pronunciation or the actual meaning in English? I’m a relatively confused Korean student who is very interested in learning but I have hit a wall. I understand the forming of a word using blocks/the structure, but the “alphabet” charts are confusing me. Are those English translations or pronunciations? Does “ㅏ” quite literally mean “A” or is that how it’s pronounced? Not the answer you're looking for? Browse other questions tagged hangul or ask your own question. Are there any online tools available for entering Korean text? Do the shapes of Hangul characters have any significance? Why did the Cia cia tribe in Indonesia choose 한 글 for the alphabet? What's the correct representation of letter “j” in korean? Is there a pronunciation difference between ᄉᅻᆯ and 서울? How can I include Hangul and Hanja in a website? How many different “blocks” can be formed from the letters of the korean alphabet? Why does 한 is spelled “o*an” but is said “han”?